Do not be alarmed by the first part of the title, Daniel David Fiszman((9 January 1945 – 12 April 2011) who in my opinion is The Original Mr Arsenal passed away a few days ago after a long battle with illness, our condolences to his family & loved ones. As a 21 year old blogger & Arsenal fan, my knowledge of Danny is rather poor & limited to appreciate all he did for Arsenal in his time, so I’ll just say this, Danny to us Arsenal fans ‘lives on’ and will continue to be amongst us. The Emirates stadium one of his many legacies should serve as a reminder for all of us about how passionate this man was about his club and how he strived hard to take the club to where it is right now, albeit not single handedly. Gone but never will be forgotten. Danny Lives On. So Arsene Wenger met with prospective owner Kroenke yesterday at the ceremony to honour the late Danny, wonder what the two must have discussed. Oh I know a few things Wenger might have said, 1) keep Fabregas from leaving this summer 2) don’t meddle in team affairs or I’ll go Tasmanian on you and leave 3) Same as number two. And Kroenke would agree with all and tell him one thing “I’ll provide you with the necessary funds and support, but I expect results and eventually trophies and no excuses whatsoever”. There you have it, the best 3 minute convo one could wish for. We don’t play till sunday and our opponents are the resurgent Kop boys and am just glad we’re playing them at home, after the way they handled City on monday we might be careful the way we decide to approach them, but am not worried, with a full squad we should dispose of them easily and stop Carrol from becoming the first player to score against us twice in one season with two different teams. That would be a pretty cool feat for the youngster though. Talking about full team and fitness, we’re boosted by the return of Chezzer, Song & Djourou and trust me am very excited to have them back for the run in and the three are most likely to go straight into the line up but sadly enough Sagna is struggling with a knock and could miss the tie so too is Rosicky but I don’t care if he’s out till 2035. Oh yeah not to miss out on the action and news, Tomas Vermaelen has a possibility of playing again this season, as reported by the official Arsenal website so don’t rule him out just yet, he’s going to be our saviour this season. Oh wait, ah nevermind. Well, its a lovely day out there, so from wherever you’re reading do have a lovely day, if for no other reason the fact that its friday. Arsenal started this weekend in an unfamiliar position; a side low on confidence was in dire need of a win to revive its feeble fight against another trophyless season. 6 weeks ago, Arsene was talking up our chances of winning all six titles up for grabs, this past week though, he could be heard saying that he was contented with a 2nd place finish for the next 20 years. How fast things change? At Blackpool, with Almunia ABSENT, Mad Jens made a surprise return to the Arsenal starting 11, injured Alex Song was also replaced by Abou Diaby and Cesc played his 300th game for the club. 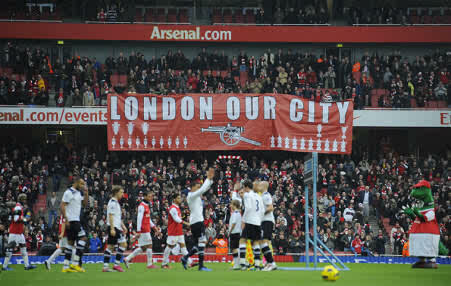 Both teams started impressively but two quick fire goals from Diaby and Eboue made things a bit comfortable for us. We went into half time with a two goal lead. Trust Arsenal though, our defence crumbled under pressure and Blackpool pulled one goal back. The dude who wrote the script for our amazing 4-4 draw at Newcastle seemed to have a hand in this one too, only that this time he was kinder with the ending. At 2-1, the game was in the balance, Blackpool with their vociferous fans had the momentum; they kept pushing and it was a matter of which team got the next goal. We could all see a pattern, Spurs, Newcastle… however, the trend did not continue. We managed to keep our calm and Van Persie got the all important winner. 3-1 it ended. It felt like we had not won a game in years, the players were visibly delighted as was Arsene. The traveling fans were magnificent once again; you could see the relief on their faces and it was great news that we have started winning again. More defining news was to come later in the day though, and at boardroom level too. On to more important news, Stan Kroenke aka Silent Stan has launched a bid to takeover our beloved club, the news broke just after the win on saturday and has so far being welcomed by almost everyone affiliated with Arsenal. I for one am highly delighted, being clamouring for Peter Hill Wood to leave the helm seeing as he had no plans or no direction whatsoever for Arsenal. 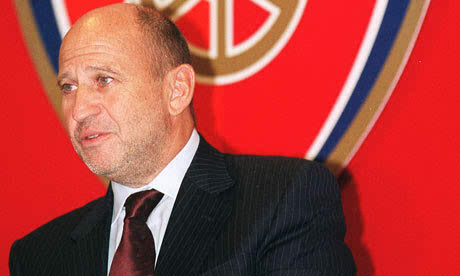 Ever since the depature of David Dein, Arsenal has faltered where it matters the most which is on the sporting front but continue to be buoyed on the financial front. Oh well, good times awaits us. I’m not going to bore you with the boring details of the whole takeover, if you want that, I encourage you to open this link to read and most likely calm whatever fears you have about a takeover. Here you go Is Stan The Man For Arsenal. But we’ll reveal the basics which most of you would know by now. Kroenke who previously had 29.9% of the shares, moved for the 15.9% owned by Lady Bracewell-Smith and Danny Fiszman’s 17.1 to take his tally to 62.9% and it was revealed that Usmanov who has a 27% stake tried his best to prevent that, thank God he failed. And after that, Kroenke is considering going the whole 9 yards and may even make a bid for Usmanov’s stake who would rather sell off now and make profits than later on. Becoming the 10th Premier League club to fall into foreign hands is not as bad and won’t be as bad as the others that precedes ours. Most people are not getting their hopes up seeing as this takeover is more of an evolution than a revolution, so expect changes but not wholesale. I’m glad to hear Kroenke call Wenger a fantastic manager and one which he’s planning on building Arsenal’s dynasty with and the feeling is mutual from Wenger who says the American has the club at heart. So there you have it, a union blessed in heaven. Don’t expect a transfer chest come end of season but you can expect funds to be available to purchase players and as for the pre season tour, you can expect the annual Austria trip to be replaced by a tour of the United States. 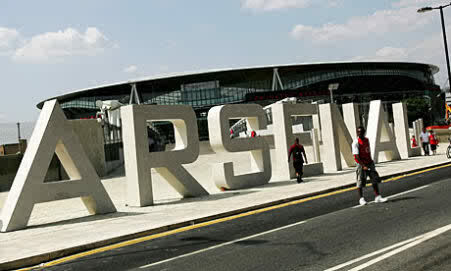 I sense good times ahead for Arsenal, and this feeling is been shared by fellow fans all around the world. Just imagine being able to compete finally on a fair ground with two or three solid signings and maybe on title next season. I’m sure you like the sound of that. We also got some good news in time for the game against Liverpool at the Emirates, Wojech Sczesney has resumed training and is pressing for a start and AW may hand it to him as he might not want to play Lehmann in back to back games, not to stop there but Johan Djourou too is in contention to start the game but that decision is up to the physios and Le Boss. No news on Song yet so it looks like we’re back to full strength just in time for the title run in which Wilshere still thinks we can win. Your thoughts?